Stay abreast of what’s buzzing in the fashion scene as HUAWEI brings more star-studded and fashionable experiences to town with its newly launched HUAWEI nova 3 and nova 3i. In collaboration with Kuala Lumpur Fashion Week (KLFW) 2018, HUAWEI will be playing host to nova fans, media friends and partners at HUAWEI Nova Superstar Night on 9 August, 7.00PM till 9.00PM at Pavilion KL. The impressive line up of fashion showcase based on the four striking colours – Black, Pearl White, Iris Purple and Red will feast the eyes. 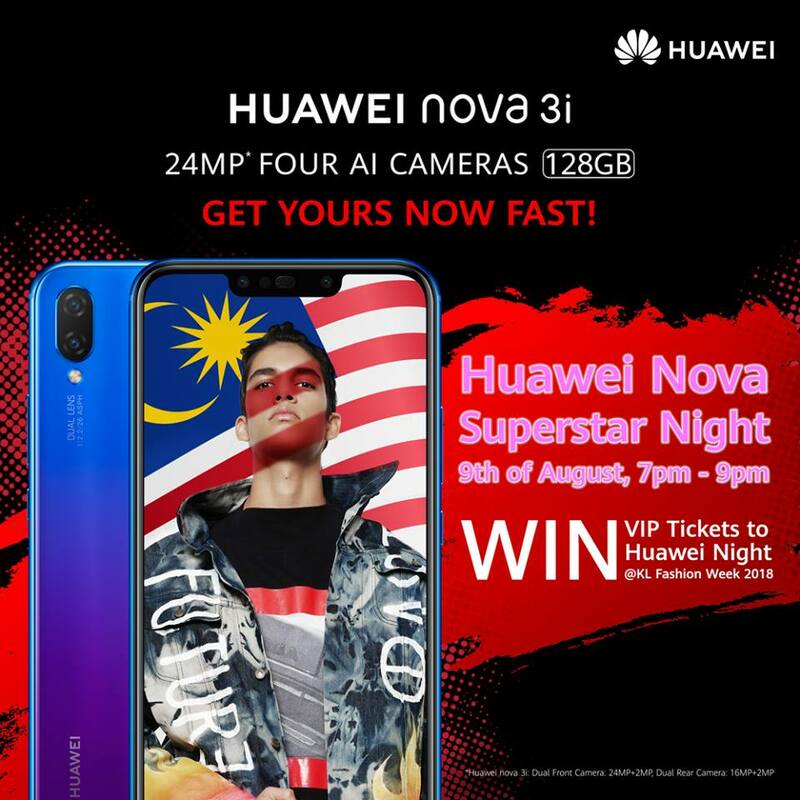 Rewarding its fans furthermore, HUAWEI will also be offering VIP tickets for all HUAWEI Mobile Facebook fans to be a part of this talk-of-the-town extravaganza. Join the HUAWEI Mobile FB Page Social Media Contest to walk away with one pair of KLFW tickets – a total 10 pairs of exclusive tickets will be given away for lucky fans. Step2: Like the contest post, share it on your Facebook account and set it as public.